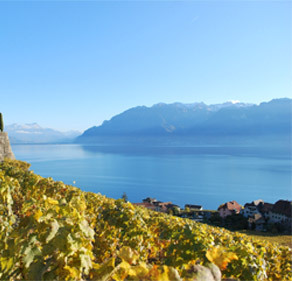 Come to the heart of the Lavaux Vineyard Terraces, a designated UNESCO world heritage site since 2007, for an unique and captivating experience at Domaine Christophe Chappuis in Rivaz. After learning about the work that goes on at the domaine, in the resplendent setting of the vineyards (or in the cellars if it is raining), you can visit the cellars and taste some of the fine wines from the domaine, accompanied by local dishes. You will then leave us with a certificate in your pocket as evidence of your work among the vines, taking with you a few bottles from the domaine. Christophe Chappuis is one of the main upholders of this winegrowing tradition which has been built up over many centuries in the magnificent Lavaux vineyards. The Chappuis family has been established in Rivaz ever since 1335 and has the distinction of producing the only Appellation Dézaley wine to have been granted the Premier Grand Cru label: its flagship wine, La Gueniettaz. Out on the vineyard terraces, with their breathtaking views of the lake, the vines and the mountains, you will have the opportunity to find out all about the winegrower’s work through the changing seasons and to spend around 1 hour putting your newly acquired knowledge into practice. Then afterwards among our oak barrels in the cellars and in our wine vault you can taste the wines from the domaine, accompanied by local dishes typical of our region. To conclude this viticultural experience you will receive three bottles of Domaine Christophe Chappuis wine and a certificate as evidence of your work in the vineyard or the cellars, in an unique site renowned for its beauty and its winegrowing tradition and listed as a UNESCO world heritage site. Domaine Christophe Chappuis farms 5 hectares in three appellations: St-Saphorin, Chardonne and Dézaley. There are 13 different wines in the range, and you will taste 5 of them. You will be given a commentary on these wines. The whole range can also be found on our website, at www.domainechappuis.ch. Among our reds, whites, rosé, sparkling or dessert wines, you are sure to find much to enjoy. We shall also explain the different types of soil in our vineyards. 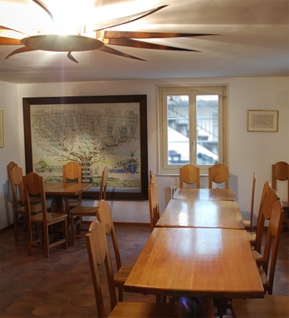 After the tasting, you will go to the Auberge of Rivaz where it will be served to you a typical menu of the region, which can change according to the season. 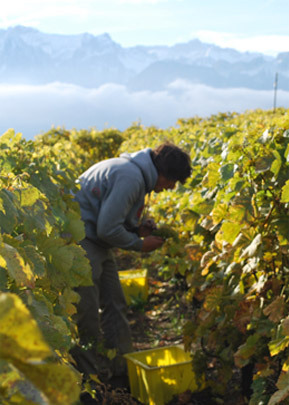 The canton of Vaud has a abundance of top quality local produce. You will have much pleasure in finding out all about our fantastic terroirs which allow our wines to fully express their character. Our visitor’s book allows you to share your experience in the heart of the Lavaux vineyards, where traditional and modern methods combine to allow this unique UNESCO site to live in harmony with its extraordinary landscape. Sharing this moment of conviviality with you is always a very enriching experience for us too. We hope to see you here soon. A bientôt !